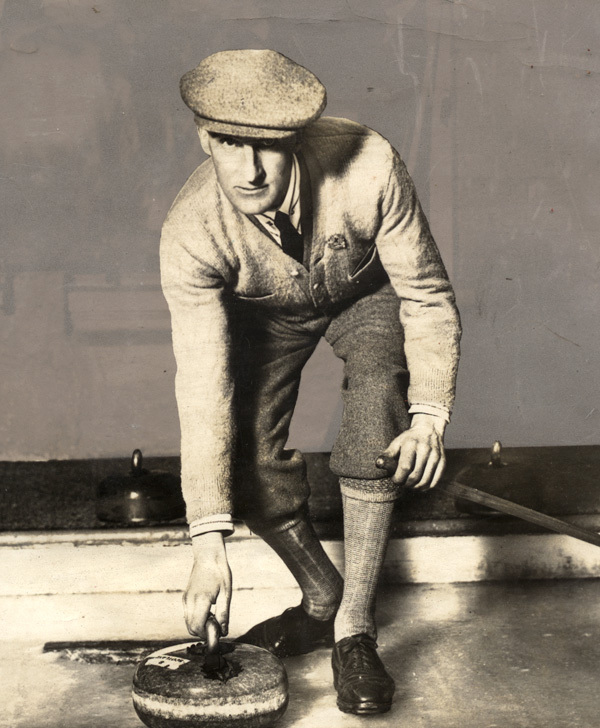 Thomas Blackwood Murray was one of the best curlers in the first half of the twentieth century in Scotland. He played second in the GB team, skipped by Willie Jackson, which won the first gold medals to be awarded for curling at the 1924 Olympic Winter Games in Chamonix. 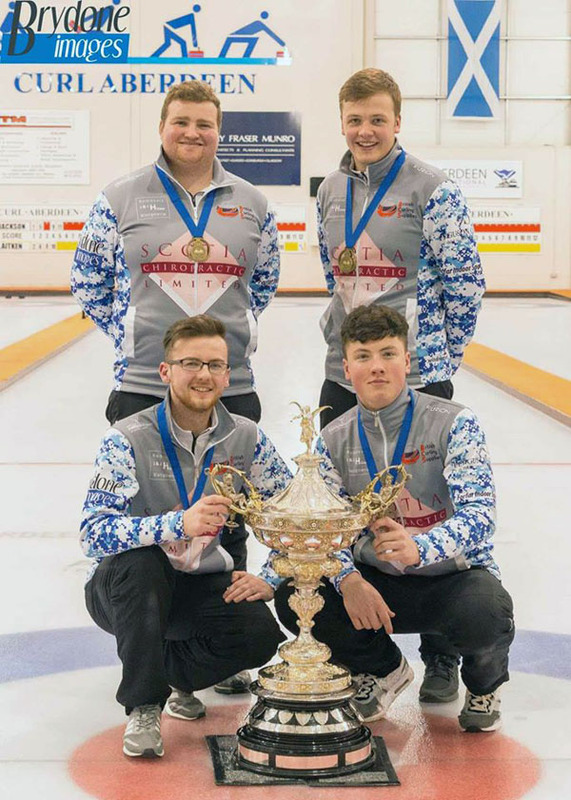 These days his name is most often remembered in association with the 'Murray Trophy', above, which is being played for this very week (January 18-22, 2017) as the Scottish Junior Men's Championship is contested at Curl Aberdeen. Murray was born October 3, 1877, in Biggar, South Lanarkshire. 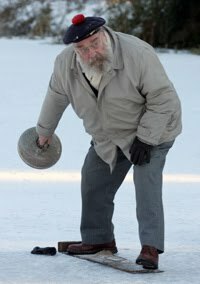 He came from a farming background and began curling at his local curling club at the end of the nineteenth century. His father, R G Murray, was a prominent curler of the time. Tom Murray was a member of the Scottish teams which toured Canada in 1911-12, and again in 1922-23. Tom Murray played with Willie Jackson in many competitions. 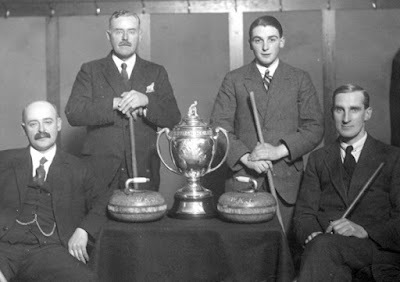 For example, here he is, on the right, as a member of the winning team of the first 'Worlds Championship' at Edinburgh in 1922, the competition that became the Edinburgh International Curling Championship, see here. The full team is (l-r) Willie Jackson (skip), Robert Jackson (lead), Laurence Jackson (2nd) and Tom Murray (3rd). And here he is, on the hack in Montreal in 1923. He served as President of the Royal Caledonian Curling Club in 1936-37. He died on June 3, 1944. His obituary can be found in the Royal Caledonian Curling Club Annual for 1944-45 which says, "Since he took part as a member of his father's rink in the match when Biggar Province defeated the first Canadian Team to Scotland, he has been chosen to represent his club or his country in every important match which has taken place. As a curler his skill was outstanding and he was always recognised as one of the best players Scotland has ever produced. His sportsmanship was widely appreciated, his hospitality was unbounded and his geniality made any meeting with him a pleasure not soon forgotten. He held many offices in the curling world and took very special pride in his election as President of the Royal Club in 1936. He threw himself wholeheartedly into all the work entailed by that position." He was a gifted after dinner speaker. 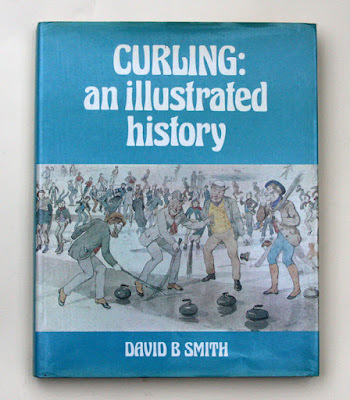 Apparently he often referred to the 'wonderful brotherhood of curling, which appealed to him in no ordinary degree'! In April 1926, at the end of season prizegiving at the Haymarket rink, Tom Murray's team had won the Director's Trophy. He used his acceptance speech to suggest that there should be more encouragement of younger curlers, saying, "He had noticed over and over again good young players who could be made excellent players but they were not getting in to the best rinks to show their ability." Murray's comments were picked up by the sub-editor on the Scotsman's sport's desk, and the report of the prizegiving in the paper on Monday, April 12, 1926, had the headline, 'A Plea for Young Men'! Tom Murray's enthusiasm for encouraging young curlers led him to present the trophy that now bears his name. It was first played for in 1929 for competition by curlers of 25 years of age and under. Here is a photo of the trophy from a newspaper of the time. The Annual for 1929-30 contains a report of the activities at the Edinburgh Ice Rink in the previous season. This says, "Both veterans and juniors were well to the fore at the close of a very successful season of the Edinburgh Ice Rink. A new departure was instituted by Mr T B Murray in the form of a competition for juniors." 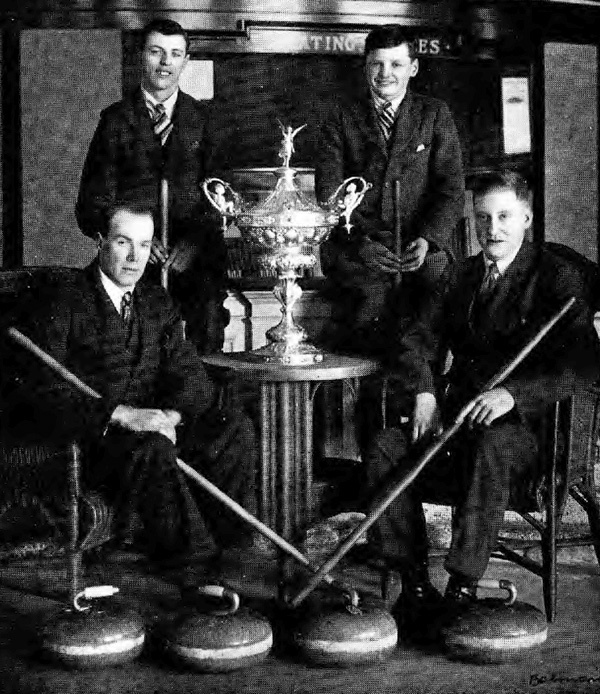 The Annual goes on to reprint what had been written in the Scotsman of April 15, 1929, "With a view to stimulating interest in curling among young players, and in order to give them an opportunity of becoming skilful at the game, the Edinburgh Ice Rink Club held a competition for junior curlers. Mr T B Murray, Biggar, the chief promoter of the scheme, gifted a Cup for competition. The success which has attended the venture was commented upon by several prominent curlers at a smoking concert held in the Ice Rink, to mark the closing of the rink, and for the presentation of trophies won during the past season. 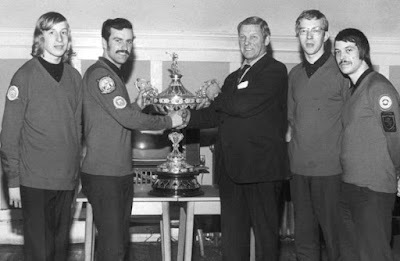 Sir Robert C Lockhart, Chairman of the Ice Rink Club, in presenting the T B Murray Trophy to Linlithgow Club, said they owed a very deep debt of gratitude to the donor. That was a pet scheme of Mr Murray's, and he had spent an enormous amount of time and trouble to foster the game among young players. Mr Jackson said he had watched some of the matches, and he admired the way the boys were playing, not because of the skill being displayed but because they were using their heads all the time. That was the way to become expert at the business. Some of them had a great future before them in curling. It must be very gratifying to the donor of the Cup to see 14 rinks of young players come up. For a great many years past they had had practically no new blood coming into the curling world, and there was no doubt that the Cup had done what the donor intended it to do. He thanked the older members who had coached the boys, some of whom, he predicted, would play for their country. Mr Murray said it was five years ago since he raised the question of the young players in that room. It was well received, but nothing seemed to come of it, and they thought they had better get a move on. He had the good fortune to be allowed to present a Cup for the competition. They thought they would be lucky to get 10 or 12 rinks, but 65 boys came up, and, as the Chairman had said, 14 rinks competed. He was pleased to hear a prominent curler like Mr Jackson say that the boys played so well. It was fine to know that their old game would go on when they were no longer there. But there was no good, he continued, in having a nursery for the young players unless these were assimilated into the various rinks. He appealed to the older curlers and skips to take one, or two, if they could, into their rinks. They could be taken into the inter-city match, and some might even play in the international." Here are the winners of that first competition for the 'Murray Trophy'. From left, clockwise: A Paris (3rd), J Morrison (2nd), I McKnight (lead), and J Oliphant (skip), from the Linlithgow Curling Club. Merchiston CC, skipped by A Allan, with W Roberts, W Ainslie and J Nisbet, were runners-up having lost to Linlithgow 16-9 in the final. The competition ran successfully in the Edinburgh Ice Rink at Haymarket until 1935 when, for some unexplained reason, it just died. The trophy was handed over for senior competition at the rink. 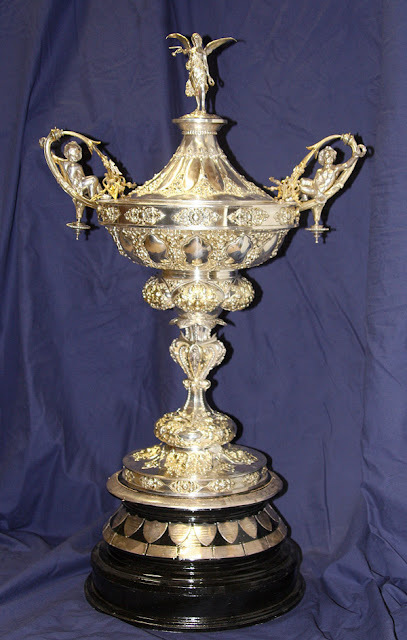 In the late 1950s, Jock Waugh, of the Corstorphine CC, who had played in some of the pre-war competitions, proposed that the cup be returned and used for its original purpose, to encourage junior play. This proposal was supported by the Edinburgh Ice Rink Curling Club and in the 1958-59 season, notice was sent out to all Scottish Ice Rinks inviting entries. Teams from Glasgow, Edinburgh, Falkirk, Perth and Kirkcaldy played eliminating ties locally before coming to Edinburgh for the final stages. Two Glasgow based teams, skipped by Robin Campbell and by Alex F Torrance (aka 'Wee Alex'), contested the final. The Scottish Curler of April, 1959, reported, "The quality of their curling was a revelation. All eight players made light of a tricky sheet of ice to play a series of man-sized ends, including many fine, and some brilliant, shots. Three ends from home, at a time when Alex Torrance was making a fighting bid to come back into the game, skip Robin Campbell played a draw which won this match and could have won any match - a full draw through a difficult port to the tee." Here is the presentation. 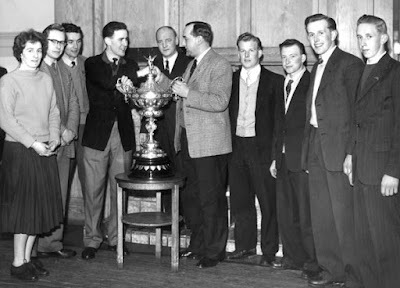 L-R: Moira Craig, Hugh Ferguson, J Hutchison, Robin Campbell, James Sellar (Manager of the Edinburgh Rink), Robin Welsh (Secretary of the Royal Club), Alex F Torrance, Robert Kirkland, Alex Torrance and James Waddell. Note the presence of Moira Craig, the lead on Robin Campbell's winning team, who, according to the Scottish Curler article, " ... with a strong, fluent delivery action, was another star in this fine performance which earned the warm applause of seasoned critics." Moira, who later married her skip, is the only female name to be found amongst the winners of the Murray Trophy and hence inscribed in a plaque on the base of the trophy. Although a number of girls played in the competition through until 1975, when it became solely the Junior Men's Championship, none were ever again on a winning side. Incidentally, it may be a surprise to those reading this in 2017 to learn that the members of the winning team in 1959 all received cigarette lighters as individual prizes, presented by Leonard and Norman Tod. Changed days! The runners-up were given tankards donated by Jock Waugh. In the years between 1959 and 1974, the competition was always thought of as the 'unofficial' Scottish Junior Championship. Just a little personal nostalgia now. Here's a photo of the 1972 presentation. L-R: Robert Kelly (2nd), David Horton (skip), Willie Wilson (Royal Club President), Robert Cowan (yes, it is me), and Brian Methven. Sadly Brian is no longer with us, and I include this pic in his memory. Modesty (almost) prevents me from saying that the April 1972 Scottish Curler report of the finals (headlined 'Horton Rink in Devastating Form') called David and I 'two of the brightest prospects in the West'! Apparently I was 'deadly accurate', and Bob and Brian 'gave solid support as the Glasgow rink swept to victory'. David and I each have our names on the trophy five times. And yes, it was a long time ago. In the 1974-75 season, the competition and the trophy had become officially the Scottish Junior Men's Championship, and Peter Wilson's team were the first winners. Above is the presentation photo. 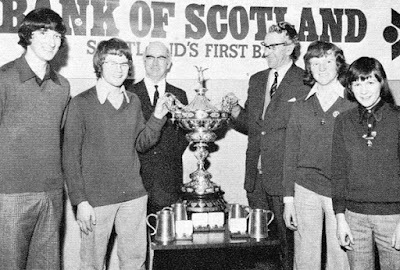 L-R: John Sharp (lead), Peter Wilson (skip), Alan Johnston (Royal Club President), Donald MacRae (Assistant General Manager, Bank of Scotland, sponsors of the competition), Neale McQuistin (2nd) and Andrew McQuistin (3rd). The team were to go forward to play in the first official Uniroyal World Curling Championship. The list of those who have won the Murray Trophy since 1975 can be found on the Royal Club website here. The origins of world junior curling are discussed here. Well done to the 2017 winners of the TB Murray Trophy! Back: Cameron Bryce, Fraser Shaw. Front: Robin Brydone, Euan Kyle. Photo courtesy of Tom Brydone. The 1922 photo of the Worlds Championship winners comes from a scrapbook in the care of T B Murray's family, as does the image of Tom Murray on the hack in Montreal, and thanks to them for permission to reproduce these. I do not know the photographers. 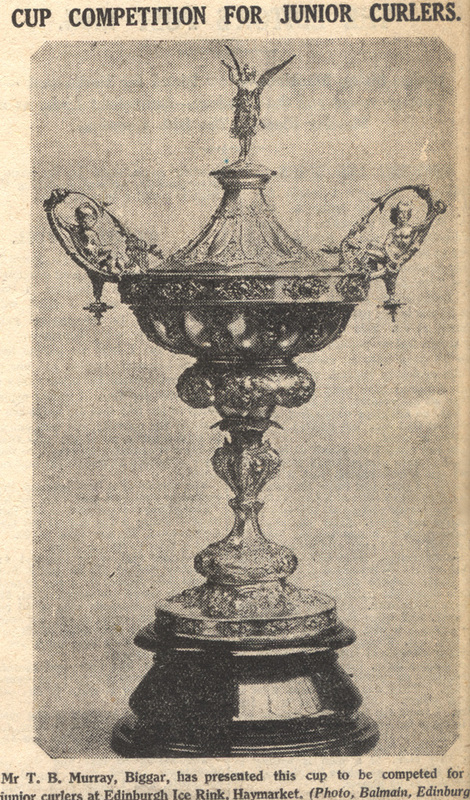 The newspaper image of the Murray Trophy is also from that scrapbook. It was taken by Balmain, Edinburgh, but I do not know in which newspaper it appeared. The photo of the first winners of the Murray Trophy is from the 1929-30 Annual of the Royal Caledonian Curling Club. The photo of the 1959 presentation group is from the author's archive, and featured on the cover of the April, 1959, Scottish Curler magazine. The 1972 photo is from the author's personal archive. The 1975 presentation photo has been scanned from the January, 1975, Scottish Curler. Thanks to Bruce Crawford, the current Royal Club CEO, who allowed me to photograph the trophy at Cairnie House a couple of years ago.